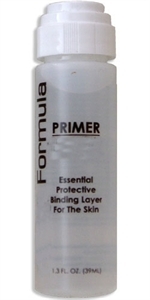 Primer is a non-oily methacrylate based protective binding layer that reduces and promotes the adhesion. Primer is a non-oily methacrylate based protective binding layer that reduces and promotes the adhesion and security of hair systems on the scalp. Primer is safe and non-irritating to the skin. Primer will help lace fronts adhere during heavy perspiration. Before Farrell adhesives are applied, be sure to put one or two layers of Primer on the skin.